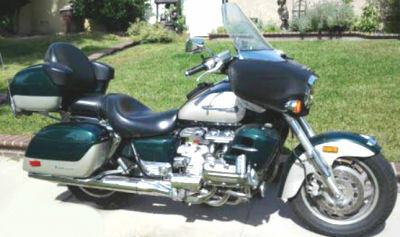 The 1999 HONDA VALKYRIE INTERSTATE 1500 for sale has hard bags and trunk, extra chrome and a really mellow sounding exhaust. The Interstate comes with the owner's manual. I have kept it in the garage and it's never been down. If you would like to write a review or voice any opinions on the nice 1999 Honda motorcycle for sale in this ad, you may use the comments form below this ad to do so. Thanks for visiting GoGoCycles Used Motorcycles for Sale and for taking a look at my HONDA VALKYRIE INTERSTATE 1500 . The location of the 1999 HONDA VALKYRIE INTERSTATE 1500 is in the city of greensburg near Pittsburgh PA Pennsylvania and in my opinion my asking price for this bike is cheap enough that it can't be beat on Craigslist or on Ebay; only $7500! If you want to take a look or have questions, call me (no e-mail)(724)858-6seven 0 four for more details and don't forget to mention that you found this ad on GoGoCycles Used Motorcycles and Parts for Sale www.gogocycles.com.